bought this old 38 super got four mags with it but none will lock the slide back, wheres best place to get new mags and stuff to rebuild old ones? I have looked at slide stop it looks good. I like Chip McCormick 38 super mags. They run flawlessly for me. I tried Cobra but they wouldn't feed consistently. I think I got them from Midway. Does the pistol have the proper 38 Super slide stop? I am assuming it is a Colt 1911. 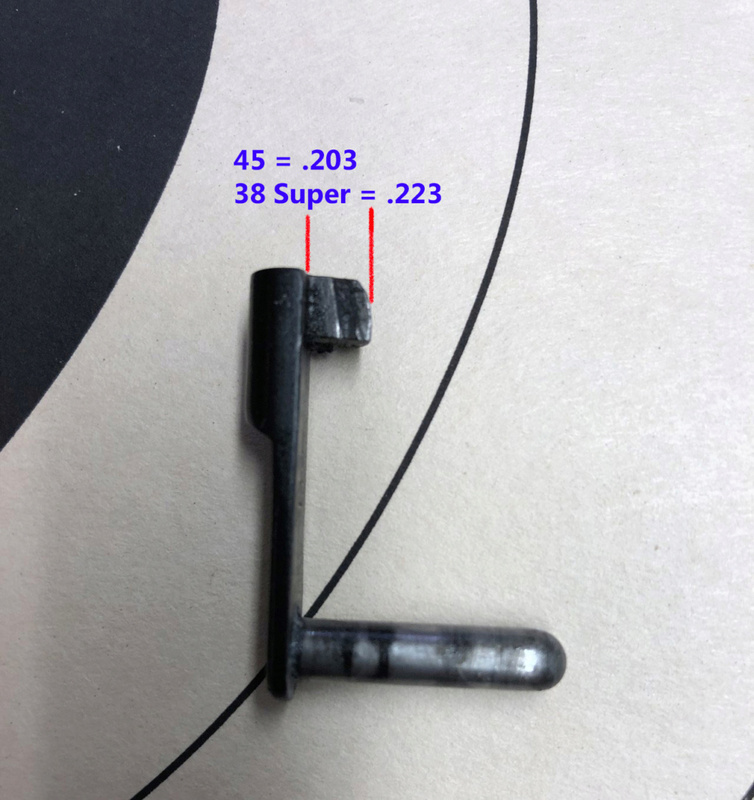 38 Super slide stop has the number '3' stamped on the inside. That doesn't mean LB used the correct slide stop. The 9MM & 38 Supper has a little longer tang to catch the magazine follower. If LB used a 45 version it will not catch the follower. A super slide stop and a .45 slide stop nose to nose so to speak. 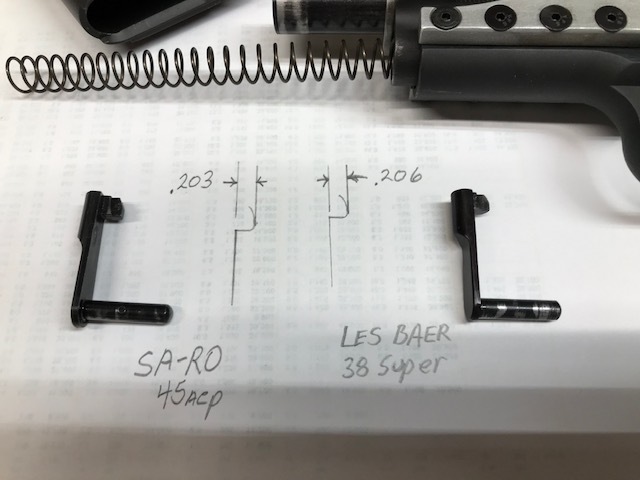 The gap between the upper part is how much longer the 38 super is then the .45. Hard to see if you don't have them side by side. Makes all the difference between works and doesn't. Great illustration, Len. That's what I love about this forum. No BS. Just good info. will I guess I don't know which feature to measure LenV are we talking about size of the slot in the end? 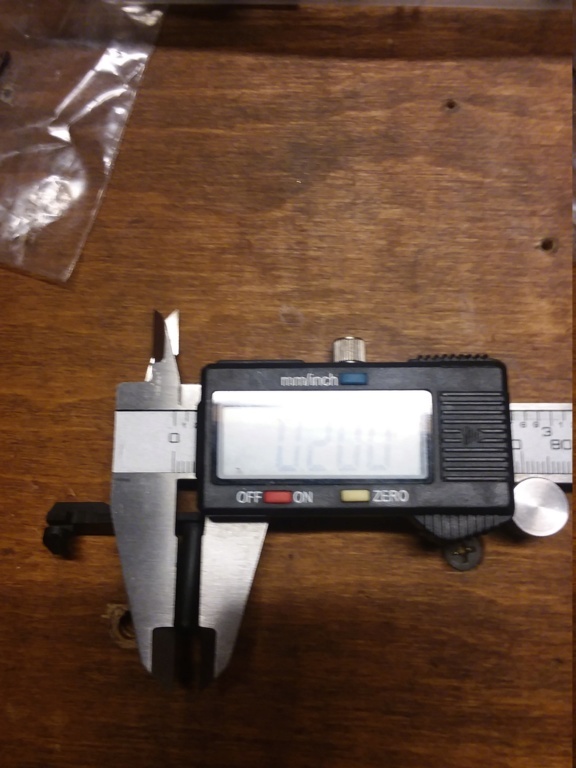 the one out of SA RO 45 measured with in .002 of the same as 38 super from the face end of lug that sticks in side the frame, from looking at your picture I think I might be looking at wrong dimension! This it the tang that catches the mag follower. The dimensions are NOT standards they are just what I measured on 2 of my guns - the 38 Super was .020 longer. 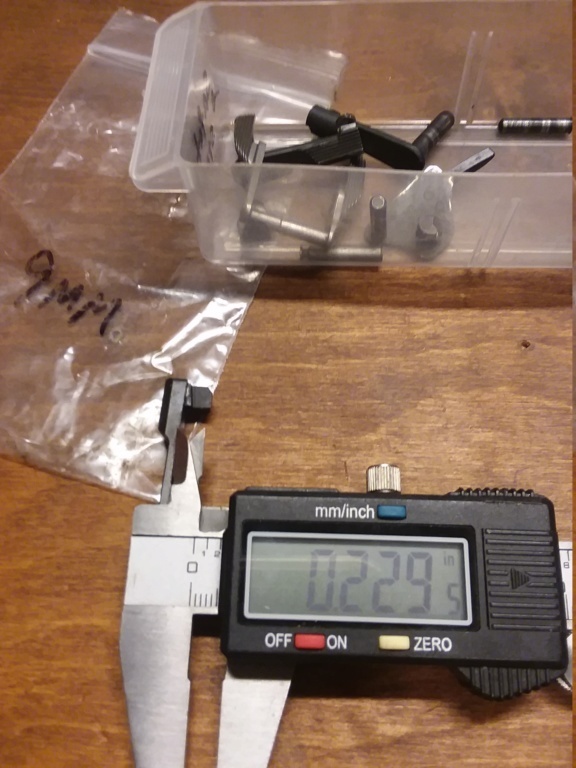 Just to be clear for those that may not be familiar with the slide stop measurements, LenV is referring to the pin size not the measurement I showed above. 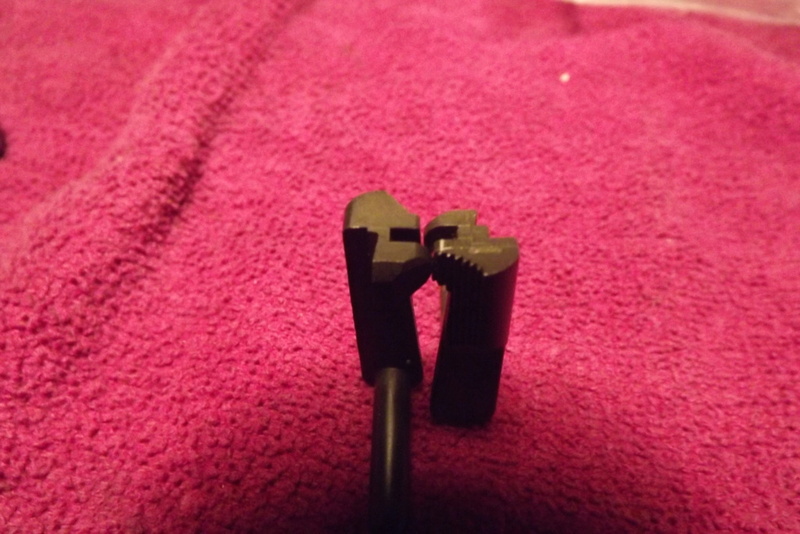 The 9MM slid stop LenV linked to will have a tang similar to the length I showed above. Just to see what the problem is, I would remove the slide and put an empty mag in the mag well. If the little lobe on the slide stop doesn't reach the mag follower, you need a new slide stop. This is also how you can see what is happening if your slide locks back with rounds still in the mag. With a loaded mag, you can see if the bullets are bumping the slide stop. Kind of hard to measure aren't they. I have a spare one here that I measured. It is considerably longer then yours. That one you have might work well on a Wilson Combat magazine since they are designed enough different that there is more lip to catch but would be too short for most magazines.